It doesn’t matter where you’ll be during the August 21st solar eclipse, NASA plans to one-up you and capture a better photo—or at least a unique one. 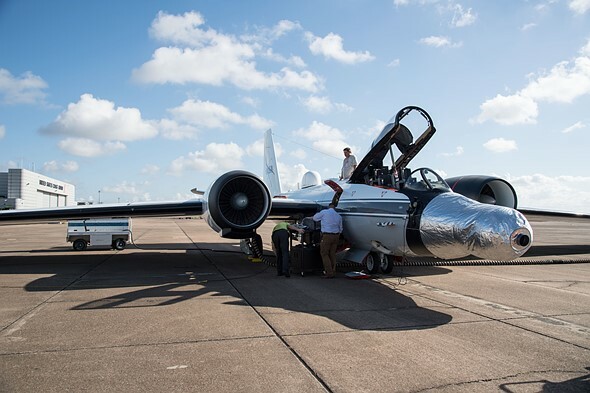 The space agency is actually going to chase the eclipse’s totality in two highly modified 1950s-vintage WB-57F jets, in order to capture the ‘clearest image of the sun’s […] corona to date,’ and the first-ever thermal images of Mercury. According to NASA, the jets will capture high-definition pictures at 30fps during the entire eclipse totality—which will last three times longer as the jets speed along, staying inside the moon’s shadow—from the stratosphere, avoiding interference from most of the Earths atmosphere. These photos will then be analyzed to determine why the sun’s atmosphere is so hot (millions of degrees), when the visible surface of the sun is significantly cooler (a few thousand degrees). To find out more about this fascinating scientific (and photographic) mission, check out the video at the top or head over to the NASA website for a more detailed breakdown of what they’re looking to capture and why.